If you’re about to launch a serious game in your organization, you’re probably pretty excited about it… and rightfully so. Games are often more engaging and effective than many other learning solutions, so learners should be in for a treat. You might even think that because your game is fun, or at least more fun than the webinars and instructor-led sessions learners are used to, that people will flock to it and start playing. If you build it, they should come, right? Wrong… unless you promote it. Yes, the L&D department has to also double as an internal marketing team when it comes time to roll out a new learning solution. Even if learners will benefit from playing a serious game, or even genuinely enjoy it once they start playing, it’s still a new task or set of behaviors you are trying to encourage. We share the example of Knowledge Guru user ExactTarget frequently because of the bang-up job they did when they first launched their MobileConnect Guru game company-wide. ExactTarget (now a SalesForce.com company) specializes in digital marketing, so they know what they are doing when it comes time to get the word out and get players involved. 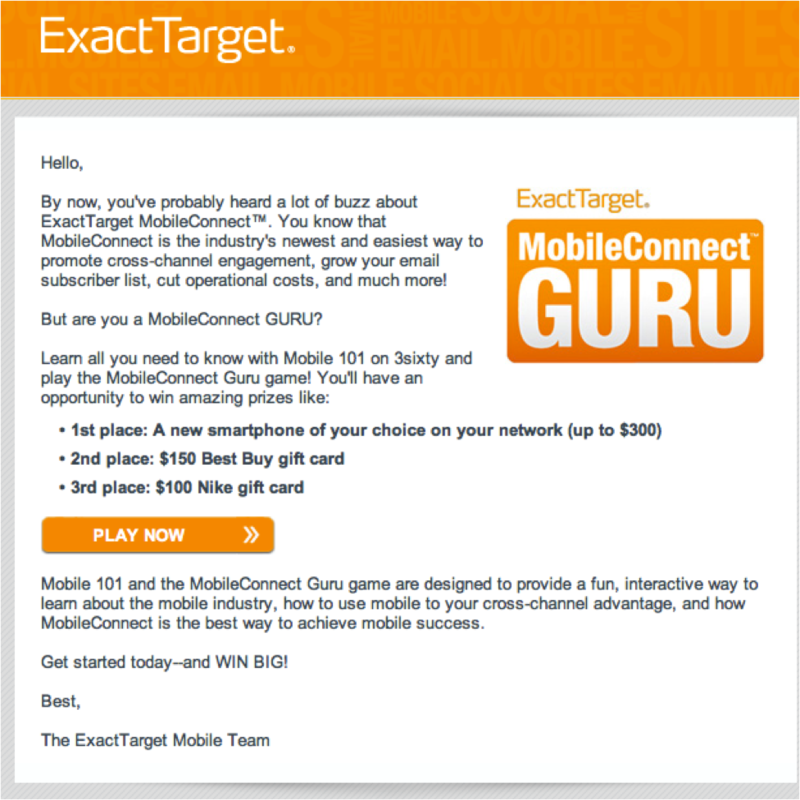 ExactTarget did many things right when they launched MobileConnect Guru, which is a big reason why hundreds of players logged significant time in the game… and drove real business results for the company. Let’s take a look at some of the methods they used to promote the game to learners. Consider using some or all of these methods within your own organization to get a serious game off the ground. Do you have TV monitors around your office that display company news? What about a bulletin board? Whatever you have, use it! ExactTarget displayed advertisements like the one below all over their offices during the first round of gameplay to turn the game into a big event. They also furnished prizes to the top scores, investing a few hundred dollars in providing incentives people would actually want. Use whatever resources you have available to make your serious game a big deal. ExactTarget has its very own internal social network called 3sixty that’s used for training and communications. Instead of just sticking a hyperlink to the game somewhere deep within 3sixty, you can see how ExactTarget placed the game front and center, integrating it with the rest of the product training. ExactTarget even added a cute “Meet MobileConnectGuru” section and added the weekly leaderboard to the home screen. Nice! Like a well-planned curriculum, a marketing campaign has to have a long tail with plenty of reinforcement. 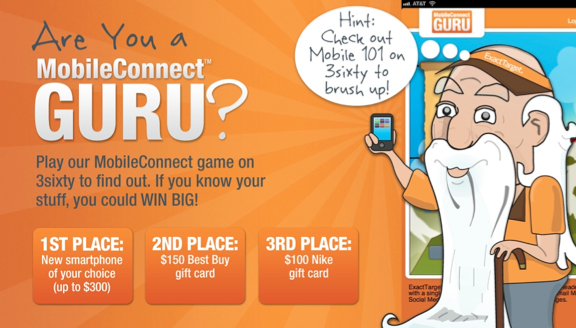 Rather than posting a banner ad or sending out a single message promoting the game, ExactTarget created multiple banners and internal advertisements to promote MobileConnect Guru for the duration of the game play experience. You’ll see that the advertisement below, while similar to the first image we showed, is different. Think of ways you can get creative and do more than the bare minimum when rolling out your game. Most professionals still live and die by the inbox. That’s a good thing for ExactTarget (they do email marketing! ), and also a good thing for you when you want to promote a serious game. Another tactic ExactTarget employed to get players to register for the game and start playing was email messages. The email below is a simple HTML message, reminding people about the game and the prizes available. It’s simple and to the point. If you don’t have an email client available for use internally, consider setting one up with a free provider like MailChimp. MailChimp is free to use for up to 2,000 email addresses, so chances are you can use it to send some mass messages to your team. 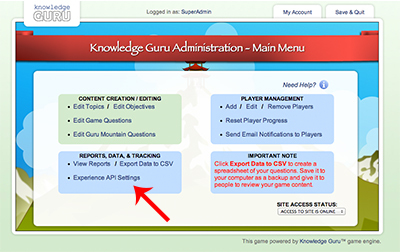 If you are using Knowledge Guru to create your serious game, the internal email tool lets you email players once they have created an account. No matter what serious game you are launching, or what resources you have available to market it internally, think through how you will remind players consistently that the game is available to play. Try to plan at last 3 or 4 different emails spaced out over time, and consider using other internal tools and communications platforms to get the word out. Get managers and supervisors involved early and remember to focus on the fun. 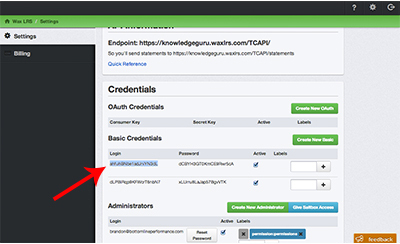 Knowledge Guru seamlessly integrates with any LRS compliant with the Experience API 1.0 standard. 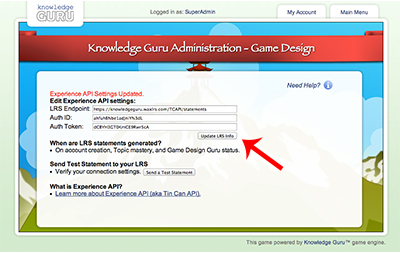 By connecting Knowledge Guru to an LRS, you can bring player activity in the game into your LRS and track it along with data points from other learning activities within your organization. LRS options will continue to expand as time goes on, but two of the most well-developed today are Wax LRS and Watershed LRS. This tutorial uses Wax LRS as an example, but the process is equally simple using Watershed LRS. 1. Create an account or log in to the LRS. 3. 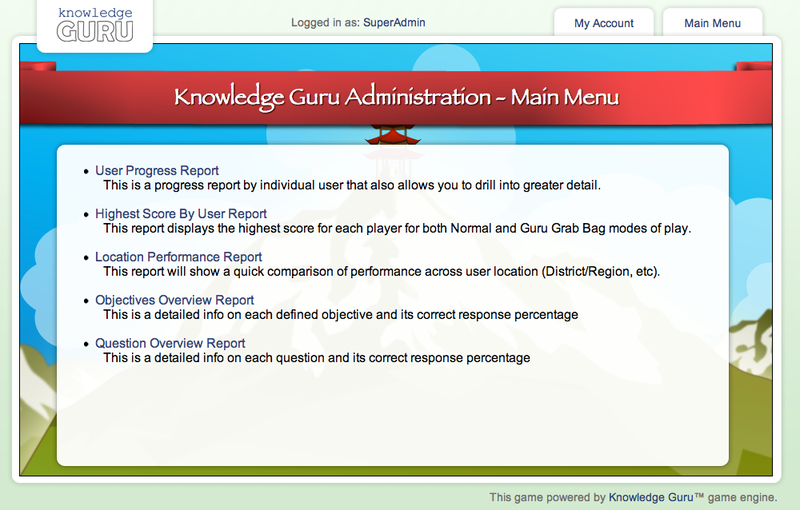 Log in to the admin dashboard of your Knowledge Guru game. 3. Go to the “Experience API Settings” page. 4. 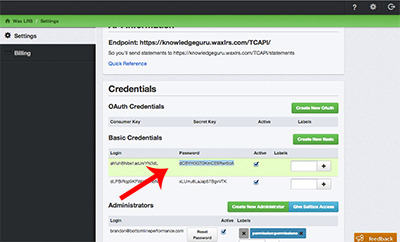 Copy and paste the LRS endpoint URL from Wax to Knowledge Guru. Make sure you copy the URL that ends in “/statements”. 5. 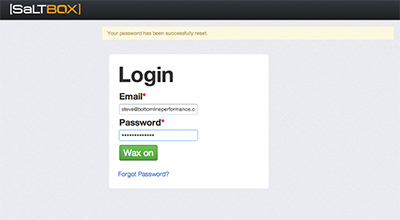 Copy and paste the “Login” from Wax into the “Auth ID” field. 6. Copy and paste the “Password” from Wax into the “Auth Token” field. 7. Click the “Update LRS info” button. A red message will appear confirming the update. 8. 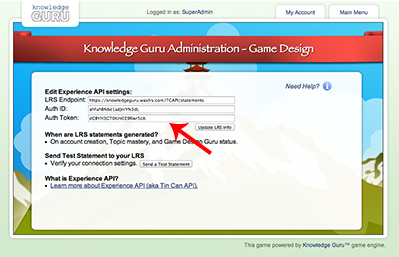 To test the connection, click “Send a test statement” in Knowledge Guru. You will see a red “Test Successful” message if you are successfully connected. 9. 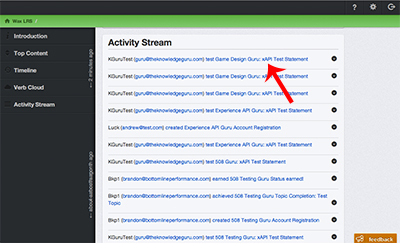 Verify that the test statement has appeared in the activity stream for Wax LRS. 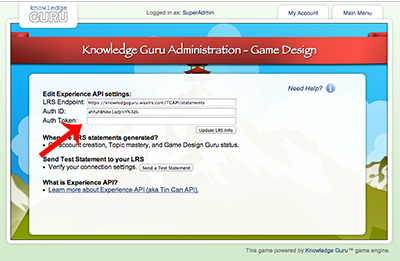 Out of the box, Knowledge Guru generates Experience API statements for account creation, topic mastery, and when players achieve Knowledge Guru status (otherwise known as completing the game). More detailed statements can be generated as an additional customization. Repeat after me: images are not decorations. At least, not in Knowledge Guru they aren’t. It couldn’t be easier to add images to your questions in the Game Creation Wizard. From the Question Editing Screen, just click the “choose file” button, select your image, and hit “save” at the bottom of the page. 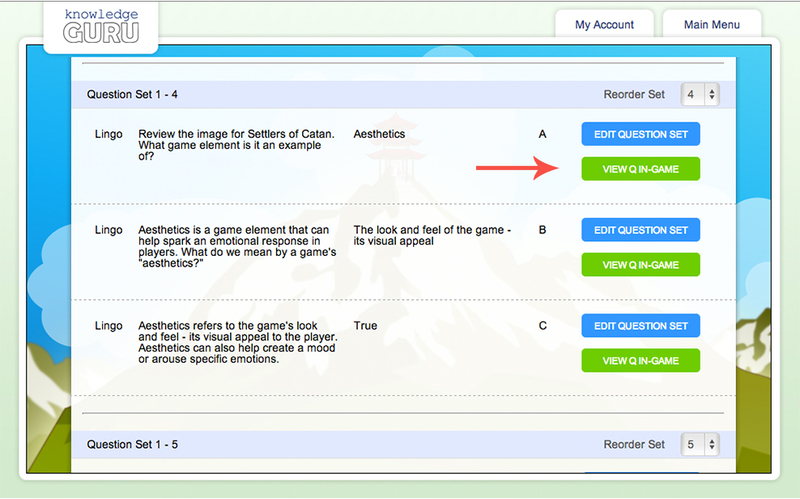 You can click “View Question in Game” on the “View Question” page to see how your image looks in the game itself. In the screenshot above, viewing the image is essential to answering the question. Users must look at the image, realize that it represents the “aesthetics” of the game, and then choose the correct response. If you can incorporate an image into the question in a meaningful way, it switches up the experience for learners and enhances your game. Otherwise, it is simply an unneeded decoration. 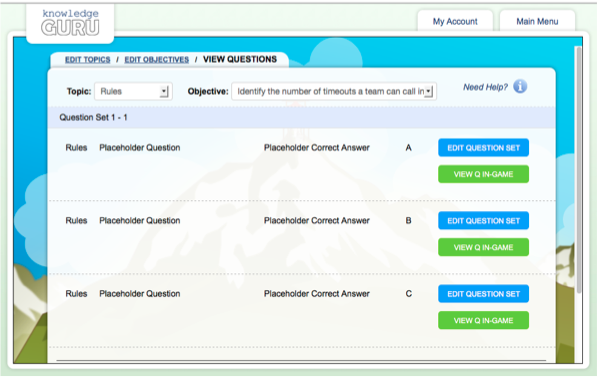 Every question in Knowledge Guru is multiple choice, with between two and four possible answers. The key to creating a challenging game that actually helps people learn is as much about the incorrect answers as the correct ones. Do give reasonable “distractors” or possible responses. Avoid the use of “all of the above” or “none of the above.” These response choices are big cues to learners of what the correct response is. The vast majority of times these response options are present, they are the correct answer. This easily demonstrates similarity of distractors because response is a number. Do keep all response options similar in length. Statistically, the longest response is often the correct response – and learners know this from years of responding to multiple-choice tests. Keep lengths similar – or, at least make sure the correct response is not the longest one. Making your distractors equivalent in length will avoid tipping players off to the correct response. True or False may seem like a basic question type, but it works just fine as one of your three iterations in a question set. If you make the question or statement seem plausible either way, learners will still find the question challenging. True/False questions are fine to use as one of the three iterations in a question set. Many types of eLearning use scenarios to help learners master new topics. Scenarios are also a popular technique to use when designing Knowledge Guru questions. Knowledge Guru questions are broken into question sets, which are three iterations of the same question. This is explained in depth in another tutorial. We find it useful to use a scenario-based question as the third iteration, or “Path C” question for most question sets. This will usually be the third question of the set that learners encounter, so it is a good way to reinforce what they have learned on the previous paths. Good scenario questions are realistic, interesting, and aligned with the appropriate learning objective. They should introduce anything that has not been covered in previous iterations of the question, but approach the same information in a different way. 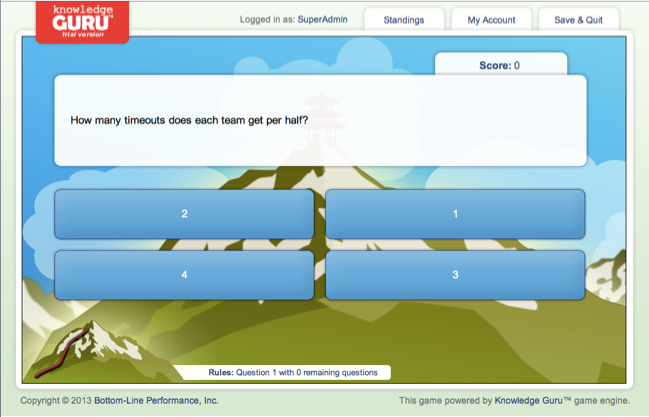 The learning objective for this question is “Identify the number of timeouts a team gets per half,” and this question approaches the objective in a straightforward way. The objective for this question was more vague: “Choose the best strategy given five end of game situations.” Since our goal was to evaluate the overall strategic abilities of the player, rather than evaluate their grasp of a specific strategy, the objective works. One way to get more quantitative data would be to identify five different aspects of the game that require strategy, break them into separate objectives, and write a scenario for each one. 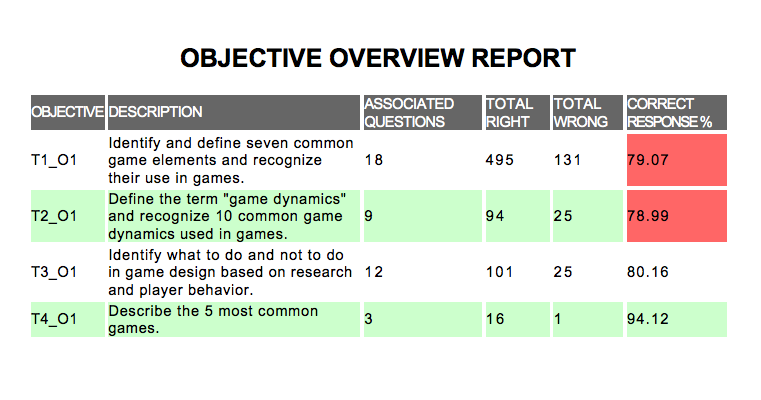 The objective here is to “Identify and define seven common game elements and recognize their use in games.” Since this objective has multiple parts (seven to be exact), there are actually six question sets written to support it. This question is part of one question set, designed to teach one of the common game elements. Notice once again that the objective is simple and straightforward. Identifying “seven” game elements instead of “being aware of common game elements” makes success much easier to measure. Use scenario questions as much as possible, usually as the third iteration, or Path C question. Make sure the scenario is realistic, and as simple as possible. Align scenarios to the objective being reinforced through the other two iterations in the question set. Don’t introduce new information in the scenario. Every topic in Knowledge Guru will have between one and five learning objectives associated with it. We recommend three to five per topic. Every question set in Knowledge Guru (more on question sets in this tutorial) is associated with a learning objective. Taking time to do a design meeting and plan out the topics and learning objectives BEFORE writing content in the Game Creation Wizard is essential to success with the tool. Try to answer the question, “What do we need learners to know or be able to do related to the game’s topics?” Your answers will help you define the game’s topics and write learning objectives. Once you have created your objectives, decide how many question sets you need to enable a learner to successfully achieve each objective. Some objectives may only require one set. Others may need up to three question sets. Start each objective with a verb: 99% of the time, the first word in your learning objective will be a verb. The verbs we listed above are great places to start. Avoid multi-part objectives when possible: If your objective is to “Explain the role of the Vice President of Marketing and the Marketing Manager in the development process,” you will probably need at least two question sets: one that covers the VP and another for the Marketing Manager. Each time you add another “part” to the objective, you’ll need another question set. Try breaking one objective into multiple smaller objectives, if possible. A simple learning objective is linked to one key fact, with a single question set, or three questions. A complex learning objective might be linked to three pieces of information, with three question sets, or nine questions. Control complexity when possible. Use your learning objectives to measure success: You can use the Objective Overview Report in the Knowledge Guru admin dashboard to see the success rate for your learning objectives. 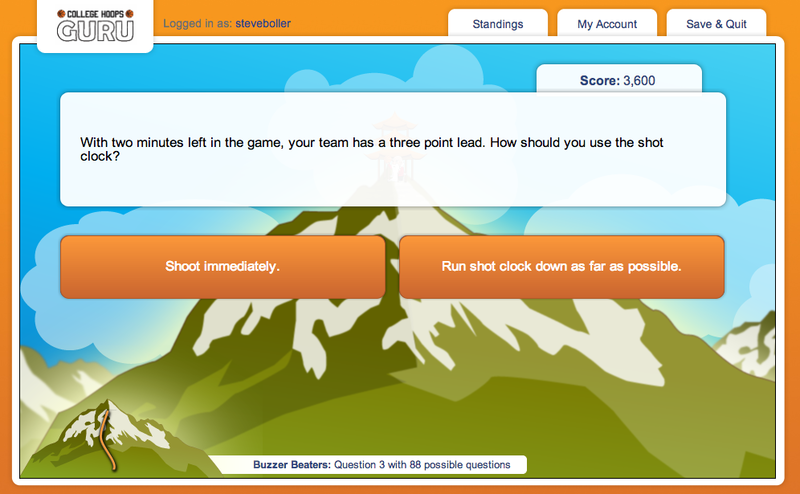 Since every question in the game is linked to a learning objective, all game activity is included. 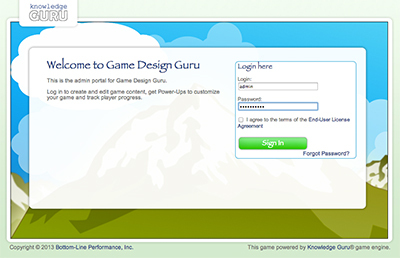 The Knowledge Guru® Game Creation Wizard is a fast, easy-to-use tool you can use to create learning games. It’s easy to put your content, facts and information you want learners to know “cold” into the game and create a highly engaging experience for players. 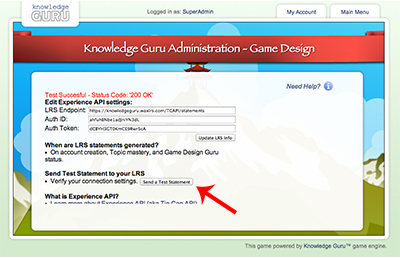 You can design a Knowledge Guru game from start to finish by following the five step process outlined below. The Game Wizard is crucial to most of these steps, but taking time to do a design meeting and plan out the topics and learning objectives FIRST is essential to success with the Wizard. Before you open up the Guru Game Creation Wizard, invite your subject matter experts to a meeting to plan your game and create the objectives for it. You can download a PDF that guides you through this meeting. Agree on the game’s title. This title should be descriptive of what the learners will become gurus of: a product, a process, an industry, etc. Answer the question, “What do we need learners to know or be able to do related to the game’s title? 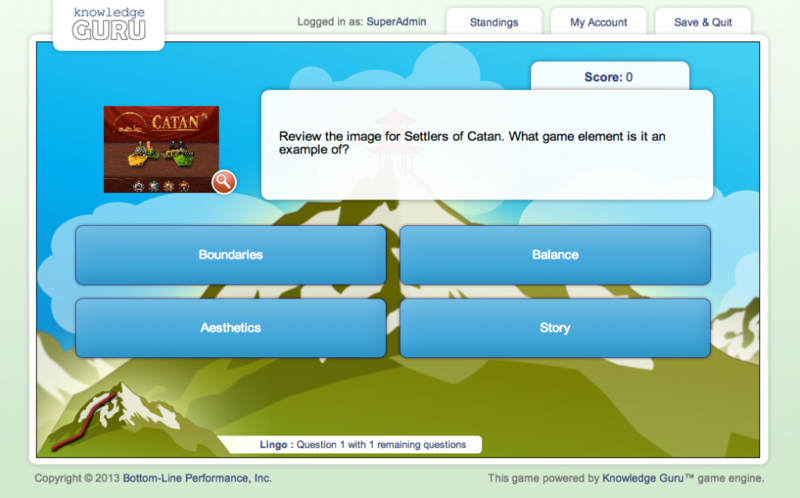 Your answers will help you define the game’s topics and write learning objectives. Identify up to four topics for your game. Create three to five learning objectives for each topic. Use Bloom’s Taxonomy to help you select appropriate verbs to include in your objectives. Examples: Identify, Define, Explain, Distinguish, Compare, Contrast. Assess each objective and decide how many question sets you need to enable a learner to successfully achieve it. Some objectives may only require one question set. Others may need up to three question sets. The game goal (which is always to become a guru of something). The target audience and your assumptions about them. The game’s topics (you can have up to four unique topics; the fifth “topic” is always Grab Bag, which is a new game that unlocks once people achieve Knowledge Guru status). The learning objectives associated with each topic and the question sets/content you plan to create for each objective. A timeline for creating and launching the game. A sample design document is located here. Talk to a Product Guru to get this as a Word document. 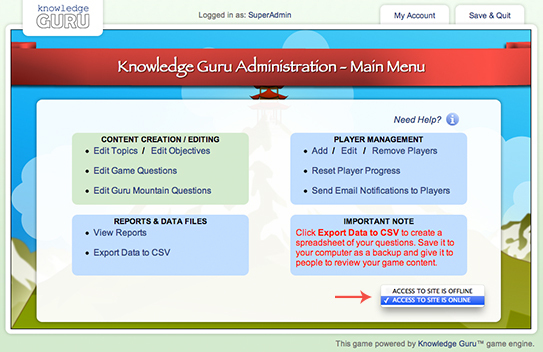 The Knowledge Guru Game Creation Wizard makes it VERY easy to create your Guru game. It guides you through the tasks you will need to complete: topics, objectives, question sets and questions. The screencast below will walk you through the step-by-step process of using the Game Creation Wizard to create content. Divide your content into up to 4 unique topics. 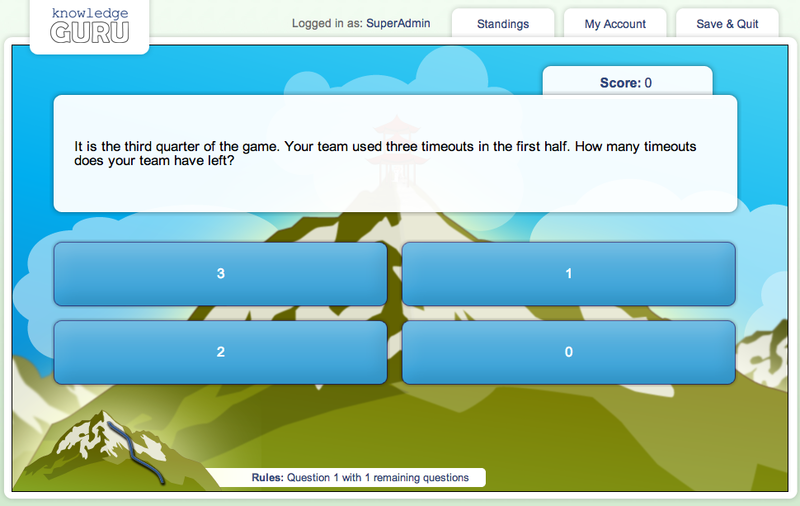 For each topic, create up to 5 learning objectives: what learners will know do or believe after completing the game. For each learning objective, create at least one question set: a group of three iterations of the same question. Usually, one question is basic recall, another is true/false, and the third question is a scenario. You can attach images to questions if you wish. Make sure each question has appropriate feedback. Players will see the feedback if they answer incorrectly. Include a humorous “Guru Mountain” question for each topic. Learners see this when they master the topic. Once you’ve created all your topics, formulated the learning objectives for each topic, and written the question sets associated with each objective, you are ready to publish an “alpha” version of your game. An “alpha” version is a live version of the game – but you do NOT communicate the URL of the game to your potential players. Instead you communicate this URL address to your review team and provide them with a spreadsheet of the questions in the game so they can make comments or suggest any revisions. Click “Export CSV” to get your spreadsheet. Select “questions table” to access all content from your game. The spreadsheets cannot be re-imported into the game. You will need to manually enter any revisions into the wizard. You will conduct a review meeting to discuss the game’s contents. We recommend you come prepared to display your computer screen so the reviewers can see the questions “in game” as you discuss any potential edits. 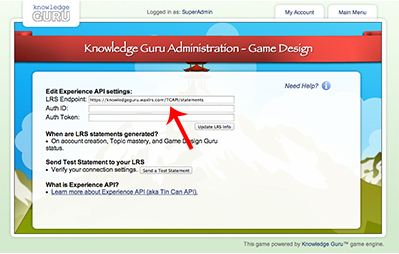 Once you’ve assigned your game a title, conducted your game design meeting and created a design document, you’re ready to start using the Game Creation Wizard to make your Knowledge Guru® game. This tutorial covers the basic features of the Wizard, and will get you up and running with the tool quickly. For a more in-depth look at the 5 Step Game Creation process, including a sample design meeting agenda and design document, click here. Decide what you need people to know or do related to your game title and organize this information into topics. You can have up to four unique topics in a game. Each topic represents a mountain within the game. Players must ascend all of the game’s mountains to earn the title of Knowledge Guru. Create learning objectives for each topic. We recommend three to five objectives per topic. Create at least one question set for each objective. (A question set consists of three questions. Each of the three questions is an iteration of the other ones so you ask the same question three different ways.) We recommend a minimum of six questions along a mountain path and a maximum of 9 questions. This means each topic should have 6 to 9 question sets, which means a total of 18 to 27 questions associated with the topic. As you create questions, make sure you create a variety of question styles: mix questions that use images with questions that do not. Make some questions true/false and others multiple-choice. Have fact-based questions as well as scenario-based questions. Create a humorous “mountain top” question for each topic that serves as the final question asked by the Guru before he confers the Topic Mastery achievement on a player. The tracking capabilities of Knowledge Guru® far exceed completion rates and post-test scores available for more traditional courses. Five different user reports are available, and each can be saved as a PDF or printed. 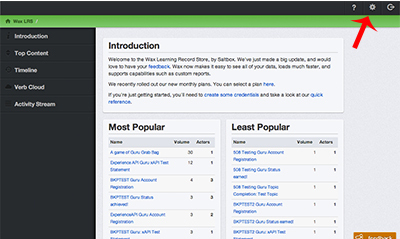 Sort all of your users by last access, mastery level, high score, location, or last name. 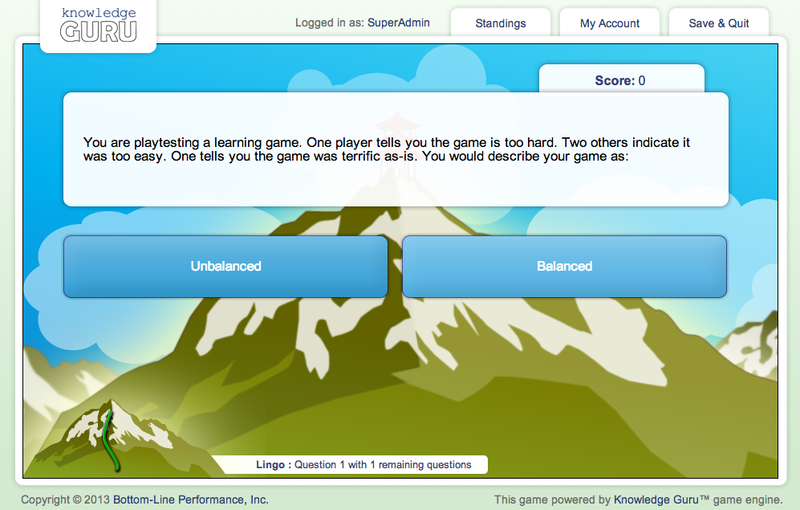 View each user’s total correct response rate, and their success rate for each learning objective in the game. Easily see the highest score each user has posted in normal game mode and the grab bag mode. This is especially useful if you are running a contest or promotion and just want a quick look at the high scores. See how each location is performing. When users self-register, they type in their location. You can edit this location or pre-register players manually in the Game Creation Wizard. If you want players to choose their location from a set group of options, such as department or branch location, you can add a Customized Registration Fields power-up to your game. See the success rate for each learning objective in the game. Get a quick idea of the overall impact of your training. 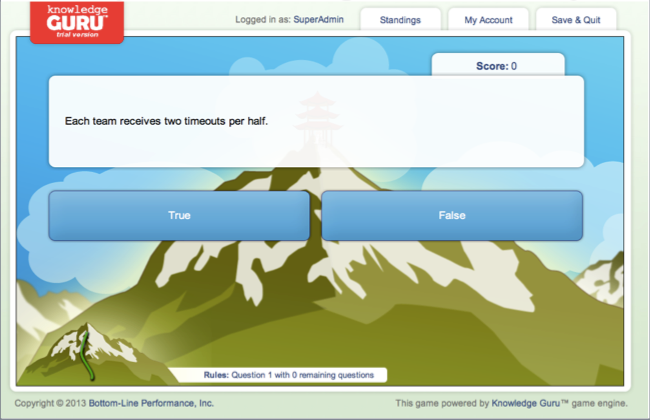 Shows the correct response percentage and total correct and incorrect responses received for each question in the game. Questions below an 80% success rate are automatically turned red. Sometimes, this indicates a gap in your training materials. Other times, a question may have been worded poorly. Either way, it’s easy to adjust. 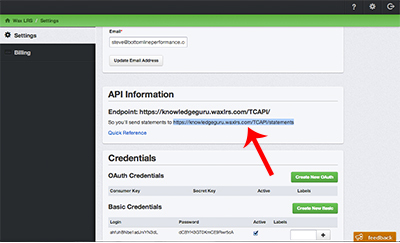 If your LMS is Experience API compliant, Knowledge Guru data can be brought into your LMS. Read more about that in this post. 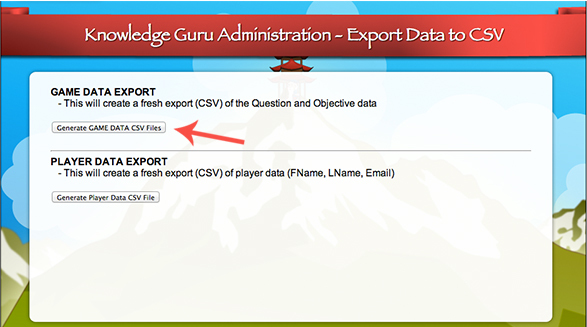 If you just want to use SCORM to track completion, you can export a CSV of your data and import it into an LMS. This will allow you to see completion data alongside your other courses.